Apple’s new Apple TV 4K/ Apple TV 4th Gen with a bunch of free and essential features might be you are experiencing. In that, how we can miss gaming, Shopping, Watch live streaming, Video, and TV shows. For those cases, you feel much needed to take screenshots or record video of your Apple TV 4 screen in HD quality. So we have a great natural option for history moment on screen picture or video to your Mac in very quick or faster way like iOS device screenshot. Learn the official way to Screenshot on Apple TV or record video on Apple TV 4 in step by step guide. For that, you need Apple TV 4, and any of the Mac Device (MacBook, MacBook Pro, iMac, MacMini) installed with Xcode for capture screenshot and Quick time for Apple TV 4 video recording. 1. Go to the Xcode and Open on Mac. (Located under /Applications folder, or search from spotlight search on Mac OS X), in the case not installed XCode – Download and install from Mac App store, it’s free. 2. connect your Apple TV 4 with Mac via USB – C Cable. (You need to buy it separately). 3. After launched XCode app, “Windows” option available on the top menu. 4. Next, Click on Devices under windows menu option. 5. here, you can list of connected devices, Apple TV 4 will be shown in the left pane. 6. On the other end, You can see Take a screenshot for Apple TV on Mac screen. You Apple TV screenshot will save on desktop screen in High-resolution quality. Quiet time for record Mac’s screen is fantastic official tools by apple. For Apple TV 4, Quick time also works for record apple TV screen on your Mac in high resolution. The Apple TV 4K and Apple TV 4 screen video recording also helpful on make preview video on gaming, Applications functionality or presentation. Follow the below steps for record Apple TV 4 screen on your Mac. 1. Connect your Apple TV 4 to Mac using USB-C lighting cable. 2. 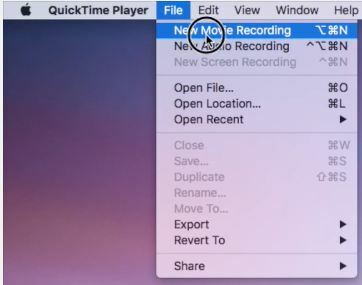 Open quick Time player on Mac under the /Applications or from spotlight search. 3. Next, From Quick Time top menu > Files > New Movie Recording. Near to the red recording button, click on an arrow. 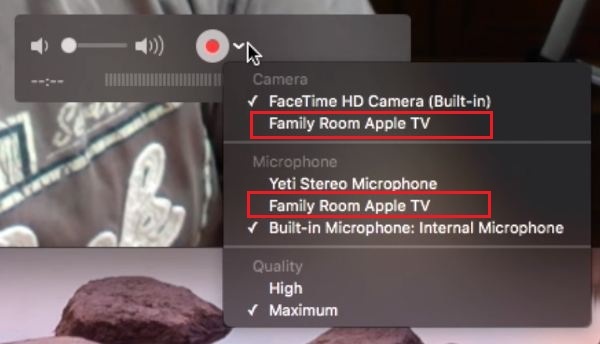 Choose Apple TV under Camera and Microphone. Then Start recording, by click on the red record button. To save recorded apple TV 4 video, Go to File > Save. Hope you will quickly navigate through given above steps for capture Screenshot or record video on Apple TV 4. Want more help share with us on discussion section.